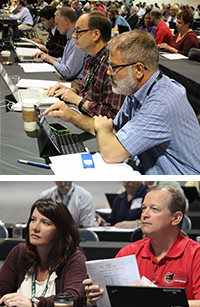 This year’s Committee Action Hearings offer code and fire officials, architects, builders, engineers, designers and plumbing, mechanical and energy conservation professionals an opportunity to provide input on proposed code changes to the Group B International Codes. The Committee Action Hearings are free to attend and pre-registration is encouraged. So whether you attend the hearings in person or participate online using cdpACCESS, you can help develop quality building codes that drive growth and affordability through innovation and safety. All chapters in the International Fire Code, International Energy Conservation Code and International Wildland-Urban Interface Code. Save valuable time and stay on schedule by signing up to receive text message updates about the progress of code change hearings during ICC’s 2016 Committee Action Hearings. Opt-in to receive text messages. Standard text messaging charges may apply. To unsubscribe, text STOP to 88202. For help text HELP anytime.